Despite Majida Hamid Ibrahim seemed just like any other victim of Iraq’s war – with her body in a plastic bag sent to morgue - authorities were already bemoaning her death. Just days before, the 40-year-old woman from Baghdad's southern outskirts became the first confirmed cholera case in the Iraqi capital from an outbreak spreading around the country. The World Health Organization has confirmed more than 3,300 cholera cases in Iraq and at least 14 deaths from the acute and rapid dehydration it causes. The troubles, however, also point beyond the immediate struggle to control the deadly advance that began in mid-August. They highlight the creeping fractures throughout the government of Prime Minister Nouri al-Maliki, the country's deepening sectarian gulf and a gangland-style lawlessness in which even medical supplies are fair game for bandits. The health minister, Ali al-Shemari, fled the country after U.S. forces raided the ministry's offices in February and arrested his deputy, accused of diverting millions of dollars to the biggest Shiite militia and of allowing death squads' use of ambulances and hospitals to carry out kidnappings and killings. The government official overseeing Iraqis living abroad was brought in as acting health minister in al-Maliki's shaky Cabinet - which was further jolted by the walkout of six Sunni ministers in August. Hospitals also are divided along Iraq's sectarian split, with Shiites and Sunnis often too scared to venture into any facility controlled by the other. For health workers, this leaves worrying gaps with cholera cases now having reached half of Iraq's 18 provinces. The main hospital in Baqouba - the city al-Qaida in Iraq earlier this year claimed as its base in the Diyala province - was twice overrun by Sunni gunmen who kidnapped some of the Shiite patients, said a provincial health official, who spoke on condition of anonymity because of fears for his safety. Fourteen Baqouba physicians and five ambulance drivers have been killed and 12 doctors kidnapped since Diyala fighting escalated earlier this year. Gunmen often steal medical equipment and medicine from health centers and force pharmacists to give up their supplies, the official said. Saeed al-Shimary recounted how four months ago, as he lay sick in the Baqouba hospital, gunmen fatally shot a hospital guard and took several patients away, including his relative. "I was horrified," said al-Shimary, a teacher. The relative's body was found days later, dumped by a road. The "bad security situation ... is preventing medical teams from reaching the residents," said Hom Suhail al-Khishali, head of the Diyala health department. WHO has confirmed at least 3,315 cholera cases and registered more than 30,000 cases of acute watery diarrhea - which could also prove to be cholera in its more common, milder form. The group has also warned that - as the weather cools and temperatures become more favorable for transmission - the bacteria could spread further. Dr. Naeema al-Gasseer, the WHO representative in Iraq, says the grim numbers fuel the panic, when in fact the death rate has been "very much less than 1 percent of the total outbreak." "Let's not focus on numbers, that's not the way to deal with cholera," she said. "We must look at ways to contain it." Cholera, usually spread by drinking contaminated water, typically causes severe diarrhea that in extreme cases can lead to fatal dehydration and kidney failure. There are normally about 30 cases registered each year in Iraq. The last major outbreak was in 1999, when 20 cases were discovered in one day. 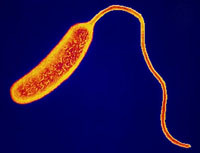 Cholera can be controlled by treating drinking water with chlorine. But authorities want to keep tight controls on chlorine supplies after extremists earlier this year placed chlorine tanks on suicide truck bombs, killing some two dozen people in several attacks and sending noxious clouds that left hundreds of panicked people gasping for breath. A shipment of 100,000 tons of chlorine was held up for a week at the Jordanian border last month, amid fears for its safe passage through Iraq. Naeem al-Qabi, from Baghdad's municipal council, said the city now has a two month's supply of chlorine and "more shipments are expected." A July report by the relief agency Oxfam and the NGO Coordination Committee network in Iraq said that about 70 percent of Iraqis are without adequate water supplies, up from 50 percent in 2003. That includes more than 2 million people who have been displaced inside Iraq by the fighting, which has forced many to live in unsanitary conditions where sewage can infest food and water and easily spread cholera. Tom Timberman, leader of a reconstruction team with the 4th Brigade, 25th infantry Division, said water purification and canal clearing systems have broken down due to a lack of maintenance and replacement parts. Many purification plant workers have been killed or fled the violence, leaving the area with a lack of expertise, Timberman said. Tests at one of the water purification facilities near Iskandariyah, a town 30 miles south of Baghdad, found the filtration system wasn't working, so dirty water was just passing through the pipes. In Mosul, about 225 miles northwest of Baghdad, officials complain that Baghdad sent them 20 tons of chlorine, while the city needs about 60 tons. "Now we fear cholera more than the violence," said Shawan Karim, 33, a resident in the northern city of Kirkuk, which has accounted for more than two-thirds of the confirmed cholera cases.